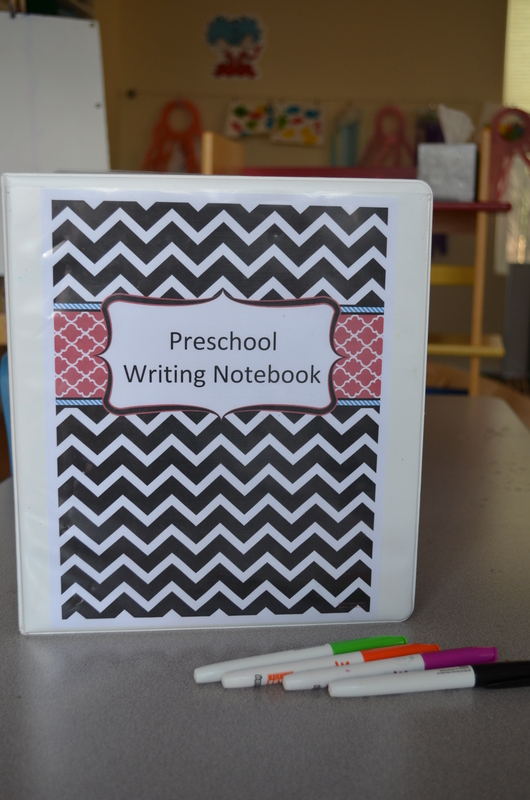 The most frequent question I am asked when people find out I am a preschool teacher is how to help children write their letters. I must admit that I LOVE this specific question because I am naturally a teacher who puts a lot of emphasis into writing and literacy. I also feel that writing should be adopted by children with admiration. I can remember feeling stressed about this in kindergarten, so I have made it my mission to find exciting and fun ways to teach children how to write. While I have lots of activities that encourage writing, here are my favorites. Play dough is such a fantastic medium. It gives children the chance to be a creator and artist, and it is super fun to write in. Just hand your little one a pencil while playing with play dough and help lead the way. Write things such as their name, their favorite animal, or how old they are. What I use for journals are notebooks — they can have a fun cover or just be something simple. I write the child’s name on the front to help with name recognition, and I offer this opportunity every day after lunch. They have a basket of colored pencils to choose from, and the writing frenzy begins. To me it does not matter if they are writing or drawing, as long as they are using the skills to progress in forming shapes/letters and strengthening the muscles that will help in writing. One of my favorite ways to teach is through some sort of sensory method. When a child is able to have an “experience,” learning stretches to greater depths. 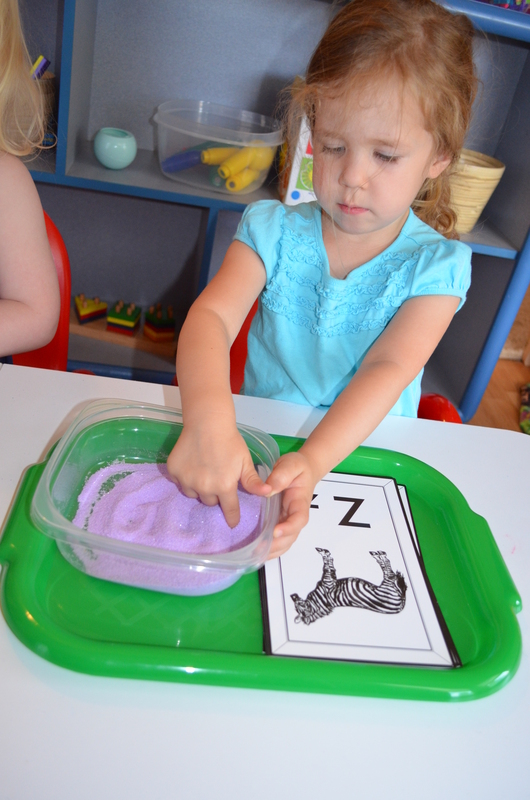 To offer this activity, put some whipped cream/shaving cream on a table top, have the child spread it smooth, and have them write letters in this foamy goodness. If using shaving cream, close supervision is necessary to make sure your child does not intake the shaving cream in any way. This has been my class’ favorite method of writing for years! I made a writing notebook by putting laminated writing sheets into an empty 3 ring binder. We have tracing sheets with each child’s name, letter and number sheets from teacherspayteachers.com (the free ones), as well as other writing sheets that correlate with what we are studying. Two of my favorite websites with printables are homeschoolcreations.com and at 123Homeschool4me.com. 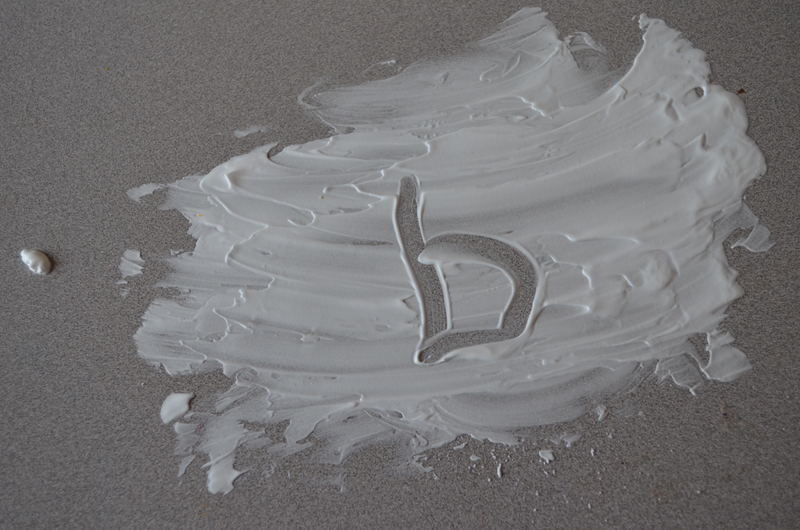 We just use dry erase markers on the laminated sheets, and wipe them off or spray them off with water when finished. I am a believer in exposing preschoolers to technology. At this point my daughter (4) is able to use the apps on my tablet as well as I am. It’s amazing how quickly they pick these skills up. I found a wonderful app called ABC tracing. This particular app is perfect for preschoolers. There is an easy and hard setting so that once your child is more proficient in tracing, they can jump up to the next level. 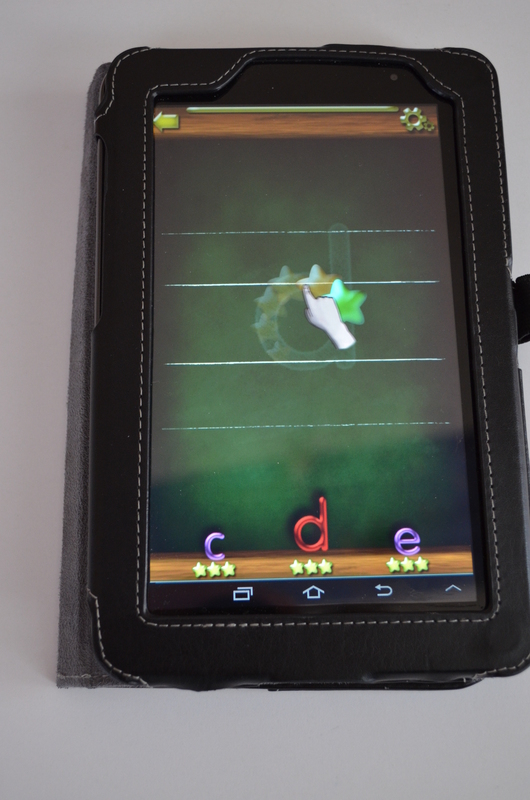 It shows how to properly trace the letter, and it is full of positive reinforcement. 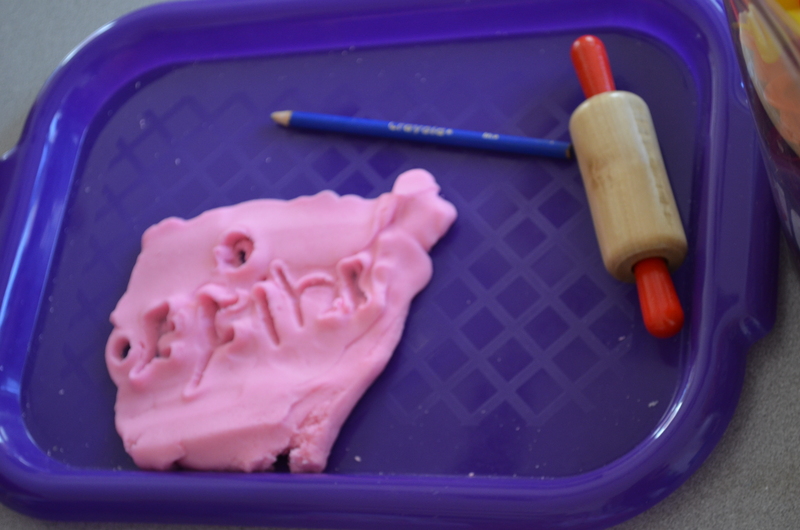 Plus you can make your own words, so you can put your child’s name in for her to practice. It was definitely a few dollars well spent to purchase this, and there is even a free version if you want to try it out first. This activity is one that I get requests for on a regular basis! I just put colored sand in the bottom of a wide and shallow container, then I put alphabet cards next to it. Each child chooses which cards she wants to trace, then she writes the letter in the sand. Plus shaking it smooth again is so much fun. When starting out I always recommend helping children write letters that are meaningful to them. Use the letters in their name or the name of someone that is very close to them. My daughter’s name is 8 letters long, so it was definitely not her first written word. Instead it was “Mimi,” a nice easy word of someone who is very important to her. 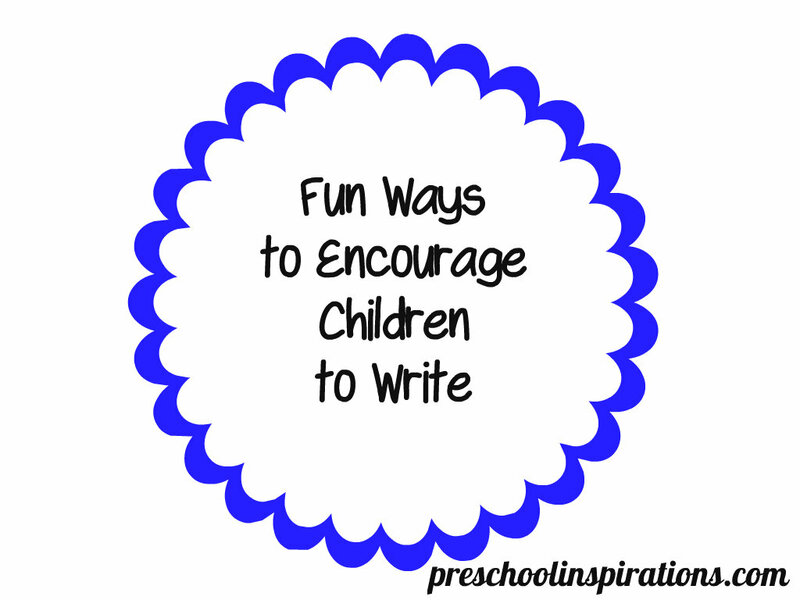 What other fun ways have you found to be successful in helping children write? Today, Alice painted the word “NANA” on a picture she made for Ben’s mom. It always takes me by surprise when she writes (or paints) a word! What a fun and magical moment!! She is such a smartie. Thanks for sharing such a sweet and special milestone :). Hi, I was wondering what kind of promps you give for the writing journal? Do you just let them freely write or do you give a goal for them to work towards? Thanks! Good question, Danielle. I do both! The writing journal is more of a confidence builder than anything, so I put seasonal printables, their names, a sign-in sheet, and the like in it. Sometimes they love the seasonal printables, but other times, they would just rather make their own picture. At the moment my class is addicted to writing, and they are mostly interested in making their own pictures with one another. I just go with the flow :). I love all these inspirational ideas! 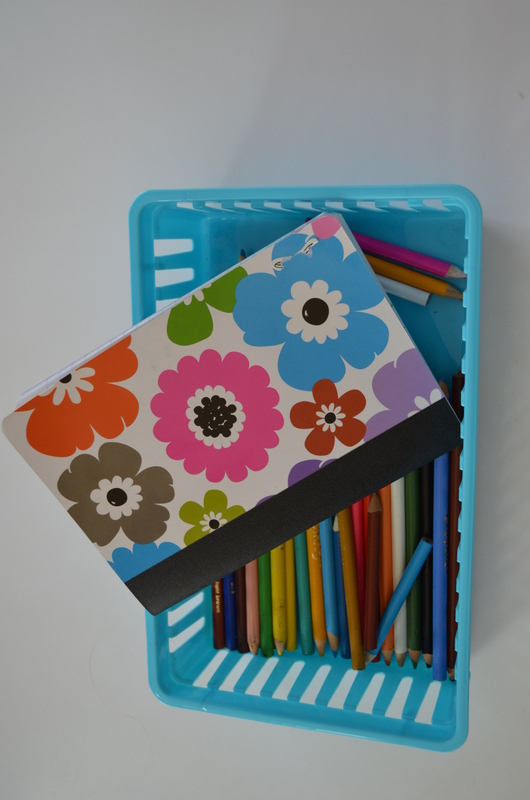 A favorite in my class is the use of a decorated mini clipboard with a sheet of lined paper and a pencil attached with a ribbon. The children walk around the room copying every word they see. This has encouraged me to label everything, including window, door, teachers chair, and so on.They use the clipboards in home living to use to play restaurant and take orders. I put on restaurant type music and the whole class becomes involved.